Webinars combine the appeal of a masterclass — private and personalized — with the learning style of a lecture. If, as a company, you’re not sure how webinars fit into your content strategy, you can see what 77 webinars have done for Kissmetrics. 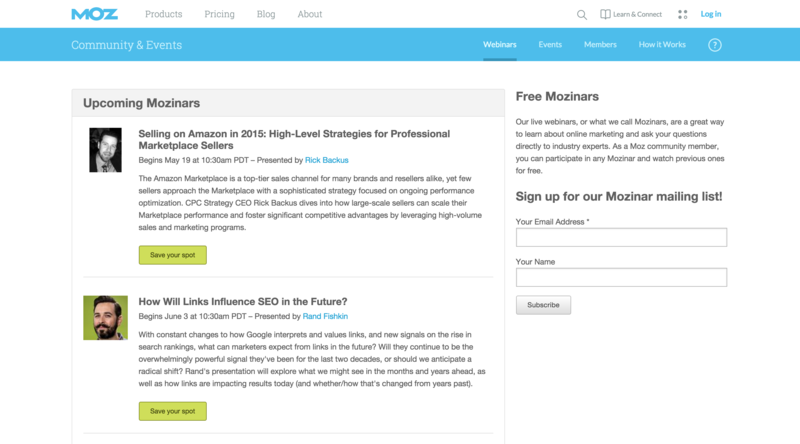 Basically, webinars are a great learning tool for marketers and startups. You get to listen to top experts from your own home or office and ask them questions — that they’ll actually answer, something that rarely happens at conferences. My team and I are all big fans of webinars; we use them to keep up-to-date with current practices, and to get ideas for new strategies for our clients. Webinars, while great, are not uncommon. We’ve picked out nine that we think will be the most helpful for optimizing your marketing and growth. 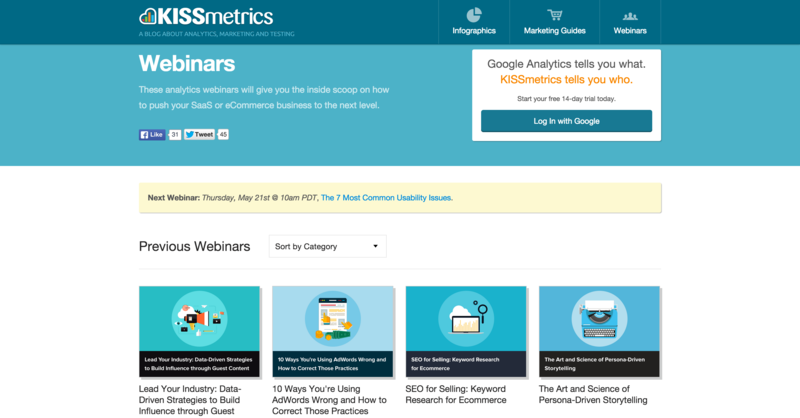 Honestly, the Kissmetrics webinars are what inspired me to start our own webinar (link) series. 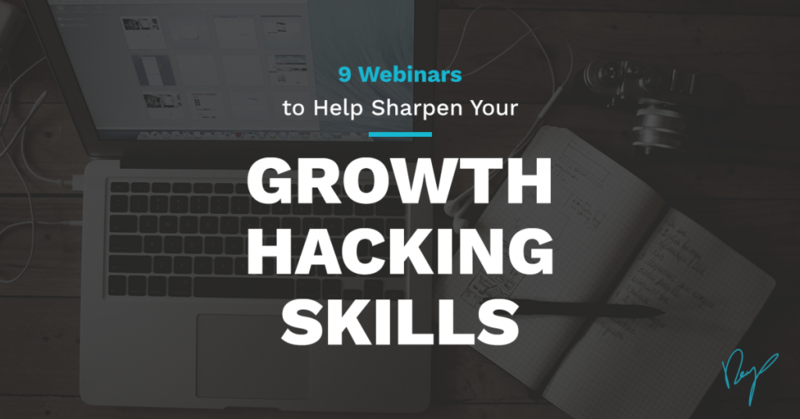 They host the most informative and diverse webinars, giving great insight about the world of analytics, data, SEO, funnel optimization and well — basically everything you’ll need to master so you can grow your company effectively. 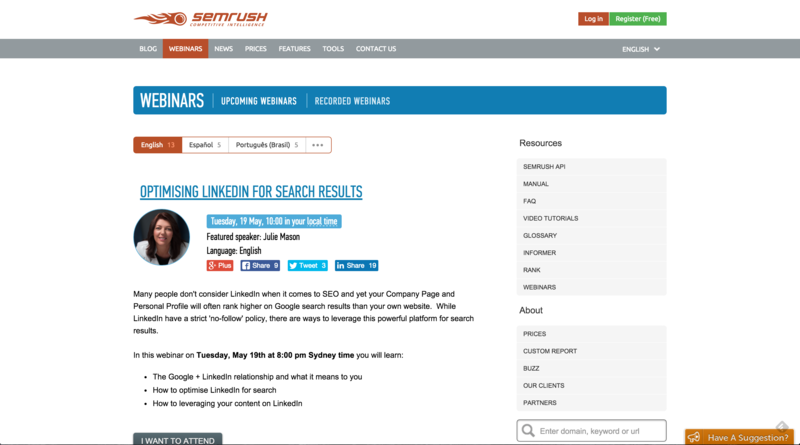 It’s one of the best webinar providers out there. 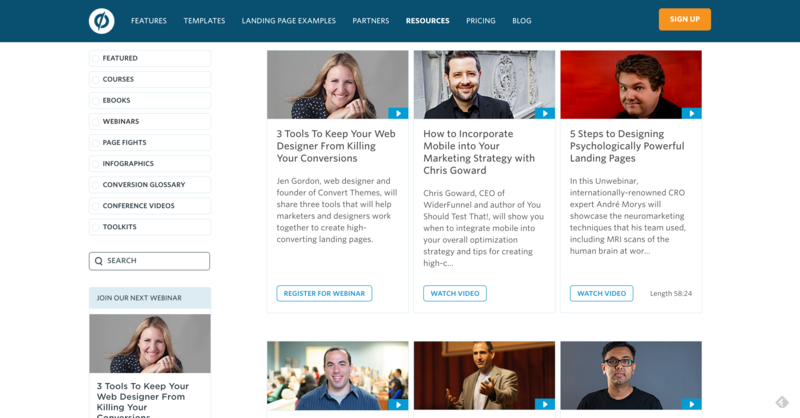 Unbounce is one of my favorite tools out there. We use it to create our landing pages, and many of our clients’ landing pages as well. Unbounce’s webinars are a great resource for anyone really into conversion optimization — especially if you’re looking to master the art of converting landing pages and A/B testing. Qualaroo – Customer Development, Testing. Sean Ellis’s Qualaroo proves that quality is more important than quantity, always. 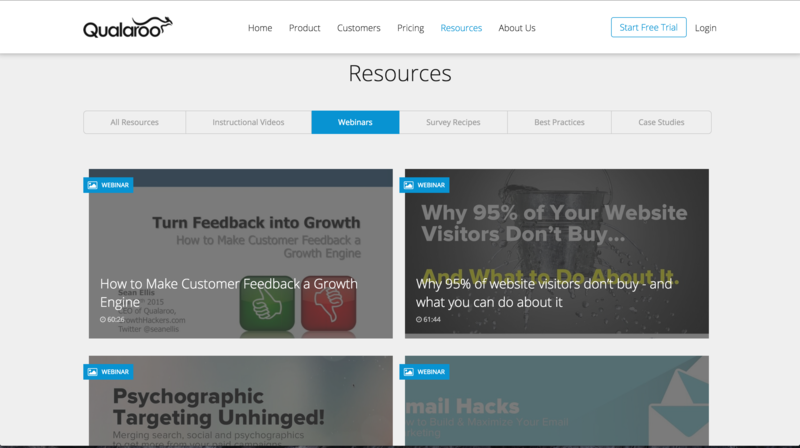 Qualaroo is a tool that helps marketers get customer feedback from their visitors on-site. 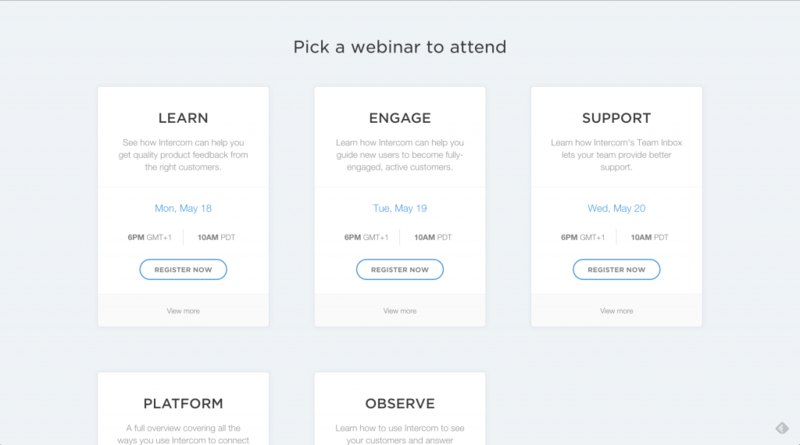 Their webinars focus on customer development and engagement, as well as improving your conversions, running efficient tests, and understanding your growth using data. 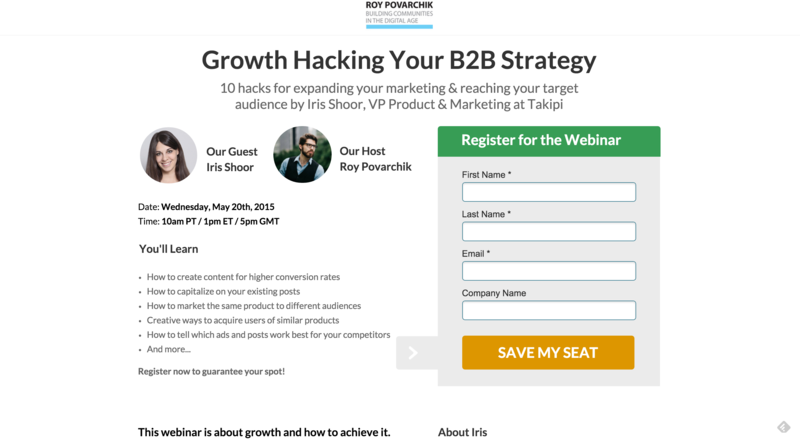 I know, it’s pretty vain to include yourself in a list of growth inspiring webinars, but check out our list of guests and you’ll understand why. I’m only moderating the webinars (with Dan and Shayna), so my promotion here is all about them. The webinars will focus on all things growth – from CRO and funnel optimization to content marketing, leveraging paid media, and retargeting campaign to landing page optimization, and using code hacks to grow your company and strategy. Import.io is a great tool for scraping the web, and it’s friendly for even the not-so-technical user. Their webinars are the best webinars on extracting data from the Internet; they’re useful and practical, with actionable tips and little-known information. Unlike the other sites on this list, these webinars are about web scraping, data extraction, visualization and using import.io’s amazing free software to do all that without coding. 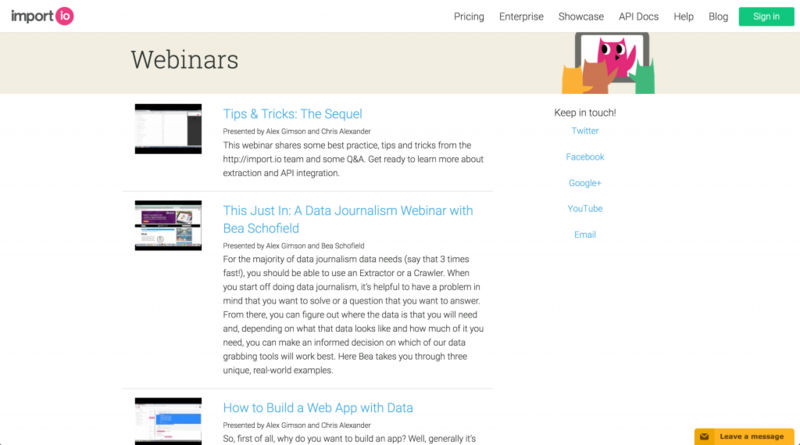 Their webinars are one of the only webinar series that is really focused on data. SEO webinars focus on tutorials that will help keep you updated with the best practices in the ever-changing world of Google updates and SEO tricks. Learning SEO can be tricky, and keeping track of the changes, updates, and trends is even harder. Keep yourself in the loop by watching some of their webinars. This is more of a customer support/help feature, but a great example of using webinars as a way to help your customers by providing personal assistance live. These webinars won’t provide any value for people who don’t use Intercom, but It’s interesting to see webinars used as an onboarding technique in such a straightforward, practical way. Moz is a well-oiled content machine with webinars geared towards solving what may seem like a every online business’ problem — SEO. Moz focuses on SEO and inbound marketing, and their webinars tackle super-focused topics and problems their users might be facing. 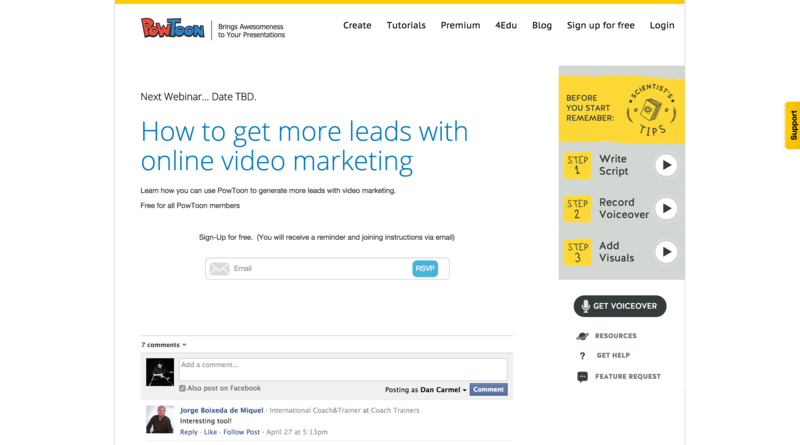 The guys at Powtoon focus their webinar on attention hacking, using video to engage your audience and get people to interact with you and your brand. Aside for their killer combination of webinars and tweetchats (double the fun), Nirel and Ari, their webinar team, are a crazy energy bomb. After many, many years of watching and being inspired by webinars, on May 20th, we will present our first! official! webinar – so we can keep passing on the gift of knowledge and inspiration that we’ve picked up from our predecessors. This week, we are hosting Iris Shoor (VP Product and Marketing for Takipi, and founder of VisualTau that was acquired by Autodesk) talking about 10 B2B growth hacks.